Thomas Todd Cooley was born on 6th August 1805 in Little Gaddesden,England. (*1) It is known that his father John Cooley and mother Sarah (nee Morris) lived at East Street, Finsbury Market, London and his father was a farrier who employed three men. Through bad connections Thomas found himself in trouble with the law and first appeared at Old Bailey on the 27th Feb. 1822 charged with the theft of a four shilling umbrella. He was acquitted of this charge. His parish of residence was given as St George's Hanover Square. His second appearance at Old Bailey was on 14th May 1823, when in company with a man named Thomas Connor, both being shown as labourers of the Parish of St. Marylebone, were Jointly charged with the theft of silver, value £22:10:0 from the home of Mr David Beavan a Harley St. banker on the 28th April 1823. Originally both defendants were found guilty and sentenced to be hanged, but the sentence was commuted to transportation for life in both cases. Thomas would have spent eleven months either in Newgate Prison or on a hulk awaiting transportation, as his ship "Chapman" did not depart untill the 6th April 1824. The trip to Van Diemens Land occupied fifteen weeks and he arrived in Hobart Town on 27th July 1824. As Thomas was a convict he needed to receive permission from the Colonial Secretary's Office to marry Margaret Paterson. He did so and they were married on 30th May 1836 in the Holy Trinity Church in Hobart. This was just four days before the birth of their first child, Sarah Morris Cooley. More information about their marriage can be found by clicking on the link to Margaret at the right of the screen. The six children of their marriage are listed under the heading Children found there also. Thomas Todd Cooley must have acquired considerable business skills, as he managed during his lifetime to have a hand in a number of enterprises. This was after a shaky start arriving as a convicted felon in Van Diemens Land in 1823. Thomas was a licensed victualler and farmer, publican, omnibus proprietor and racehorse owner. His sons John and Charles both became involved in the bus business, even running rival companies at one stage. 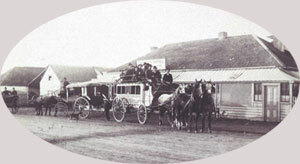 This photo of Cooley's Hotel in 1888 is reproduced with permission from the Archives Office of Tasmania. Read a story printed in the Illustrated Tasmanian Mail from March 1934 by clicking on this link. Thomas Todd Cooley owned a champion racehorse called "Swordsman". Click here to read more about the part horses played in the lives of the Cooley family. Thomas Todd Cooley died on September 22nd 1886 and the following obituary appeared in the MERCURY Newspaper on 23rd September. Yesterday there passed away, at the ripe age of 81, Thomas Todd Cooley, who arrived in this colony in 1823, and went as a farrier with Col. Arthur through from Hobart Town to Launceston and various other parts of the island, the trip occupying several months. He was at one time in the employ of the late Mr James Cox of Clarendon, and afterwards went into business as farrier, etc. in Liverpool St. Hobart, at a place of business designated the "Leaping Bar", opposite the present General Hospital. He continued there for some years, untill 1839, he was induced to start in business as a licensed victualler and farmer at NewTown, which was at that time and for many years after, the only outlet of Hobart. For several years he carried on successfully his two branches of business being patronized largely by the military officers and other residents of Hobart and the surrounding neighbourhood. He applied himself steadily and carefully to his business, and was also a well known sportsman in the racing field, in the time of the "Fields", the late Sir Richard Dry, Kearney and many others, and was at one time the owner of the successful horse "Swordsman", afterwards sent to Adelaide. He was well known in the racing field up to about 1853, and in fact for years afterwards, when all the principal races were held on what is termed the old racecourse. He then purchased the omnibuses which had been started by a Mr Johnston on the road between NewTown and Hobart, and which have remained in his hands, and that of his sons ever since, and are now carried on by his son Mr. C.M. Cooley, the present well known proprietor. After living for 47 years in this one establishment, business of which he carefully studied and bought to a successful issue, Thomas Todd Cooley has died as he lived, an honest and straight forward man, his principle being "do unto others as you would they do unto you".